In the web menu, choose Documents in order to upload documents to prove your company identity and to see their approval status. Registration Proof Proof of registration from an official authority. Proof of Identity Identity proof of the registered legal representative: ID card (both front and back), passport (if you are outside of the SEPA area) or driving license (if you are from UK, USA or Canada). Articles of Association Certified articles of association (statute). This is a formal memorandum stated by the entrepreneurs. Shareholder Declaration Ownership statement of the company shared capital. 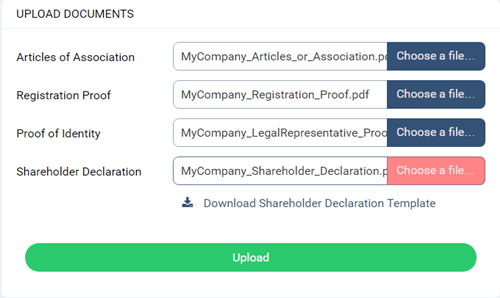 This is a document that you must download by clicking on Download Shareholder Declaration Template, then fill in, and then upload in the dedicated box. After choosing the files to upload, click on the button Upload. The status of your documents will be Validation Asked. Usually, documents are approved in maximum 48 working hours. After validation process, the status of your document will become either Approved, or Refused. In case a document is refused, a refusal reason is always provided. You must upload documents again if you wish to become a REGULAR user. Click on the eye-like icon to see a document that you have uploaded. You are not able to revoke a submitted document, so make sure you upload the right ones from the beginning.